In todays changing environment, leaders need a concrete guideline to help meet new challenges and update standards and assessments. New educational regulations and laws pertain to accountability issues, testing methods, assessment, teacher certification requirements, and safety in schools, and they also serve to update preexisting methods in leadership skills. This book will help leaders develop s… kills to successfully adopt new techniques that are vital when dealing with national and state requirements and enacting new laws that pertain to education. 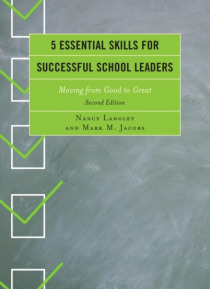 5 Essential Skills for Successful School Leaders provides a detailed and comprehensive look at theories of leadership styles and behaviors, and it presents the reader with five characteristics that enable a rising or veteran leader to become proficient and effective in his or her role. Using real life stories and examples, the authors illustrate how to bring about change and be a successful leader utilizing these five traits: insight, interpersonal skills, self-growth, flexibility, and keeping in touch with the community. This book is a useful tool for all administrators and professors of educational leadership.